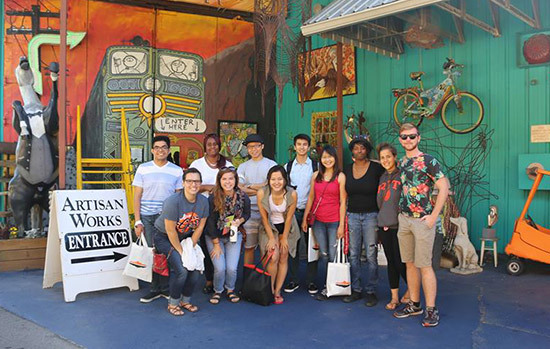 RIT students visit Artisan Works in Rochester, one of several Into the ROC events allowing them to better know the community. When Bobby Moakley came to Rochester to attend college, he didn’t know much about the city. “I thought it was a has-been city. But I know it has a lot to offer now,” he said. Moakley, a second-year environmental science and global studies double major from Boston, is the student coordinator of Into the ROC. Into the ROC was created last fall and operated by RIT’s Center for Leadership & Civic Engagement to enable students to experience cultural and recreational activities in the Rochester area and allow them an opportunity to volunteer to make the community a better place. “It also was created to help students think about staying in the Rochester area after they graduate,” said Program Coordinator Kathryn Horan. A dozen events are planned each semester. Half are devoted to civic and community engagement and half are opportunities for cultural engagement. They have visited Artisan Works, the Memorial Art Gallery, the Susan B. Anthony House, Mendon Ponds Park, the Corning Museum of Glass, Letchworth State Park, and they plan to kayak on the Genesee River on May 7. They have volunteered for the Fast Forward Film Festival, which showcased locally-made films, and helped the Flower City Pickers at the Rochester Public Market, delivering unsold merchandise to food kitchens and collecting waste for composting. This Saturday, they plan to participate in “Pick Up the Parks,” joining others to collect trash in Genesee Valley Park. Students can still register for the event, which includes transportation. Horan said about 300 students have already participated. She hopes that number will grow to 500 in the coming years. A $50,000 donation, over five years, from Kovalsky-Carr Electric Supply Co. is sponsoring Into the ROC. Company officials plan to join the program's steering committee which is comprised of members of the RIT and Greater Rochester communities. Horan said the donation will be used to continue and expand the program and help pay for transportation costs. Word is spreading about the program through their Facebook page and fliers that are posted around campus, Moakley said. Moakley plans to talk about Into the ROC at Rochester’s Intercollegiate Council to encourage students from other colleges to advocate for their schools to develop similar opportunities.